Last updated by Mark Jala at February 27 . The KitchenAid Gourmet Stainless Steel Cookware Set is healthy, dishwasher safe cookware with the ability to delve into some higher-end cooking methods. The silicone rims on the glass lids adds a nice touch to keep the cookware quiet and help keep liquids inside. The cookware set comes with a pretty complete selection of pieces. It is ready for induction cooking, as well as gas or electric. Glass lids feature a unique silicone rim to create a tight seal and help lock in flavor and prevent rattling. Glass construction allows you to monitor the cooking progress without lifting the lid. 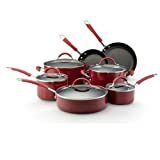 A KitchenAid Gourmet Stainless Steel cookware set would make an excellent starter set for someone wanting healthy cookware with the ability to delve into some higher-end cooking methods. 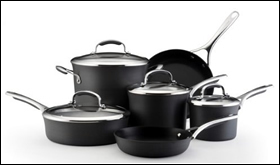 KitchenAid Gourmet Hard Anodized Cookware is an inexpensive, tough, nonstick cookware meant to last a long time. The glass lids are great to see how the food is cooking. It is induction ready. Anodized aluminum cookware heats very evenly and makes cooking a lot easier. The tough 3-layer nonstick interior surface will last a long time when hand washed and used only with wood, bamboo, or plastic utensils. Users love this cookware and give it excellent reviews. Heavy gauge hard-anodized construction is twice as hard as stainless steel and distributes heat evenly. This cookware features a handle crafted of a combination of soft silicone and quality stainless steel. This cookware set is an exceptional value, including all of the pans needed to equip your kitchen with the most used cooking pieces. As the set contains only basic pieces, you'll really use each and every pan. It includes saucepans for whisking a homemade sauce or cooking your morning oatmeal, a big stockpot for soups, stews or boiling pasta, and skillets (probably the most used pan in any kitchen) that will help you turn out perfect omelets or a simple grilled cheese sandwich. The set also includes a covered sauté pan, a wide, straight-sided pan that can perform many of the functions of a skillet but features deep sides for extra capacity, perfect for one dish meals. Start your dish in this pan by sautéing onions and browning meat, then add your liquid and other ingredients into the same pan to finish on the stovetop or in the oven. Two of the most used pans in any well-equipped kitchen. 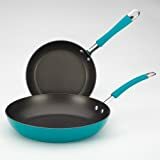 Skillets have sloped sides so that foods slide out easily and are used for cooking omelets, pancakes, quesadillas, sauteing vegetables, searing steaks, fish and poultry. The nonstick surface makes cleanup effortless. Heavy gauge hard-anodized construction is twice as hard as stainless steel and distributes heat evenly. Elegant windsor shapes look great and speed evaporation and sauce reductions. Experience the practicality and style that only nonstick aluminum cookware delivers. 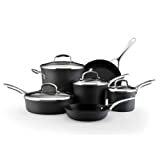 This Aluminum set includes 8" Skillet, 10" Skillet, 1.5-Quart Saucepan with Lid, 3.0-Quart Saucepan with Lid, and 8.0-Quart Stockpot with Lid. The ridges raise food so fats drip down and away from the food allowing for low fat grilling. A channel around the edge of the pan collects cooked-off fat. Great for grilling meats, fish, vegetables or sandwiches. Superior nonstick interior is designed to provide maximum food release, durability and easy cleanup. The beautiful porcelain enamel exterior is stain resistant and easy to clean. Heavy gauge construction heats up quickly and evenly, reducing -inchhot spots-inch that can burn foods. Ridges and valleys help give cooked food distinctive grill marks just like outdoor barbecuing. By providing two sizes of skillets for one great price, this twin pack is an economic way to add to a cookware collection. The shape of these skillets makes it easy to slide foods out of the pans and onto serving plates to wow guests with impeccable presentation. The 9-inch skillet is perfect for cooking omelets and vegetable side dishes, while the 11. 5-inch skillet is roomy enough to pan-fry pork chops or sear salmon for a delectable dinner. KitchenAid Porcelain Nonstick cookware is great for stylish kitchens that are busy too. The exteriors of these skillets are coated in porcelain enamel, which not only brings a touch of style to the kitchen, but is also durable and easy to clean. The skillets themselves are constructed from heavy gauge aluminum so they heat rapidly and evenly. The double riveted stainless steel handles, covered in silicone, are strong and comfortable. These skillets are oven safe to 400-degree f, so if a recipe starts on the stove and finishes in the oven it can all be completed in one piece of cookware; and the reinforced nonstick interiors mean that less time is spent cleaning up after meals. 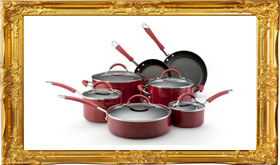 The skillets can be used with confidence because they carry a Hassle-Free Replacement Warranty.